In the middle of Stockholm you will find Skepps- and Kastellholmarna with their marine heredity and environment from the time when the Swedish marine had the islands as its basis. 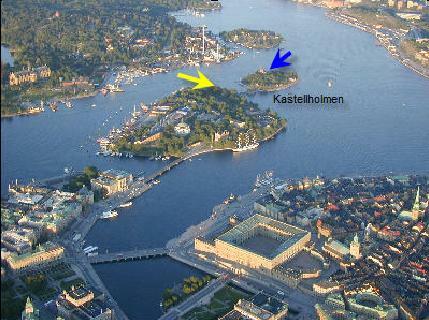 The FlowMac conference will took place in the Citadell (kastellet), (blue arrow). M/S Segelkronan, a floating restaurant, wa the place for meals (yellow arrow). Around the island you will find many spectular places and from the top of the Citadel a marvelous view over beutiful Stockholm. Speakers: Vidoeprojector available. Computer with Windows XP. Extend6, Powerpoint 2003. Speakers can use their own computer and test it early morning. 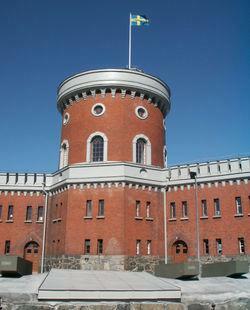 The citadel (kastellet) is open from 0800. 1010-1030 Olle Alsholm - Increased efficiency through data retrieval. 1035-1055 Bengt Nilsson Pulp-Mac AB- The mission and the size of the model. 1345-1405 Harald Janisch, Bruck, Austria - Modelling of Profitability increase of a deinking plant. 1410-1430 Martin Åberg, ÅF-Process. Demonstartion of a FlowMac case. 1435-1455 Håkan Fridèn, Fridén InfoTech AB. Connecting Flow-Mac models to the real realtime world. 1515-1545 Lars Nyborg Upgrades in FlowMac incl. Extendsim Version 7. 1545- What to improve in FlowMac? Additionals? New technology? Discussion - Moderator Nippe Hylander, ÅF. Latest 1800 A beer on M/S Segelkronan. Coffea is served from 0900 and the conference will run between 10:00 and 18:00 and end up with a drink and a dinner on M/S Segelkronan. WLan availble in conference area. Informal dress. Hopefully summer has arrived. Mention Papermac in your booking. Walking distance, 1 km.